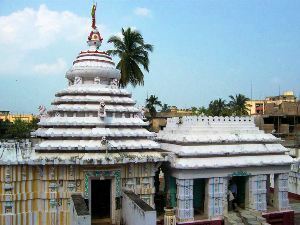 Raghunatha temple is famous and old temple of Odagaon, which is 26 kms far from nayagarh .Here,on Ramanavami great festival occurs.It is said that the reowned poet of Odisha Upendra Bhanja mediated here and attained perfection in the Rama Taraka Mantra.This temple was built around 1903. Raghunatha of Ramachandra are seen of two types: Banavasi and Abisheki. Banavasi Rama,Laxmana and Sita are seen in woodland altire with bow and arrow.Whereas Abhisekhi Rama,Laxman and Sita are seen in royal altires with words.Rama and Laxman are with beards.In Nayagarh,Raghunath with wife sita and brother Laxman seen altire.The important Raghunatha Temples in the house of Raghunatha Bebarta(Nayagarh Old Town),at Mausima temple (Nayagarh) at Dhenkena and at Odagaon.The the Raghunatha temple at Dhekena is important since Kavi Samrat Upendra Bhanja received Rama Thakura Mantra here.